Laboratories are places of discovery and scientific progress, housing both the research that matters and the researchers and equipment responsible for it. All that science, though, takes energy, and many facilities—especially those with significant ventilation needs—utilize it in high volumes. To combat this issue, some are looking to zero net energy (ZNE) laboratories as the sustainable, environmentally friendly homes for the science of tomorrow. What is a ZNE lab? In brief, a ZNE lab is a building that produces as much energy as it consumes, achieving maximum efficiency and often embracing alternative forms of energy like photovoltaics. Since this energy balancing act is a product of careful architectural design, engineering and equipment planning ZNE labs are not yet common. How does a ZNE lab work? We've established that a ZNE lab produces as much energy as it consumes—that, as one can expect, is easier said than done. One way to control the energy expenditure of a lab is to focus on the fume hoods: although the percentages vary depending on the source, it's common knowledge to lab designers that fume hoods are the biggest offenders when it comes to energy consumption. Choosing a more efficient system and using it mindfully can drastically reduce a lab's energy footprint. Various versions of high performance and ductless fume hoods play different roles in conserving laboratory energy. 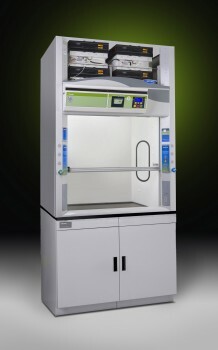 Though one energy efficient fume hood is not ideal for all applications, all laboratory personnel can learn the important distinctions between the various types of high performance fume hoods and their uses. The very most energy efficient hoods are ductless and filtered fume hoods, which can handle a much wider variety of applications now than was possible historically. Many of the aforementioned initiatives are large-scale design and equipment based, as ventilation efficiency and overall construction play a significant role in the energy rating of a building or lab. It's important to note, though, that change needn't be on such a grand scale to be impactful. Smaller modifications—many based on the behavior of humans within the lab, not necessarily its brick and mortar construction or contents—can also help with sustainability. ZNE labs certainly get the gold star when it comes to energy initiatives (or Platinum, if we're talking about LEED). The equipment choices and design techniques that allow labs to attain this ZNE rating are well thought out and require an environmental commitment at every step. However, a key takeaway from this discussion is that conserving energy on any level in the lab is a worthwhile endeavor. If we are conscious of our actions both at home and in the lab, we can be part of the solution rather than contributors to the problem.